Because home prices are expected to continue to slowly rise in many parts of the country, it makes sense that most homeowners would desire to stay put rather than upsize to a new house. Although the grass might look a little greener elsewhere, it’s possible to add value to your current home—even if you’re on a budget. We get it: You’re not going to invite friends over to see your new attic insulation.But it’s a wake up call to realize that this project has the No. 1 ROI on Remodeling magazine’s Cost vs. Value report list—a whopping 107.7%. You’ll not only profit when it’s time to sell, but you’ll also see immediate savings from the ongoing energy efficiency this upgrade provides. A properly insulated attic, combined with sealing air leaks throughout your home, cuts an average of 15% off your energy costs, allowing you to pocket the savings month after month. It’s possible to add value to your current home. Cost: $500 to $1,000 for insulation , depending on the R-value (effectiveness resulting from type, thickness, and density), and $100 to rent the machine that blows in the fiberglass if you’re a DIY type. If you hire a pro, labor will run about $40 to $70 an hour. Time investment: For an average-size attic, it should take a reasonably skilled DIY-er about four hours to complete the project. Related: SoFi’s Home Project Value Estimator compares your project type to regional resell data so you can estimate a project return. The ROI of new vinyl windows, according to Remodeling magazine’s list of “upscale” home improvements, is 73.9%, which is almost 15% more than a kitchen remodel (61.9%) . And with an average cost of nearly $19,000, the whole kitchen remodel dream may not make your to-do list, but with a much lower average cost, you could consider window treatments that help conserve energy and look sharp, such as plantation shutters. Cost: Anywhere from $165 to $375 for a standard 3×5 window . Time investment: You can buy standard-size shutters off the shelf; delivery time for custom special orders can be 4 to 6 weeks. The average DIY installation time will depend on your skill level and the number of windows you want to cover. 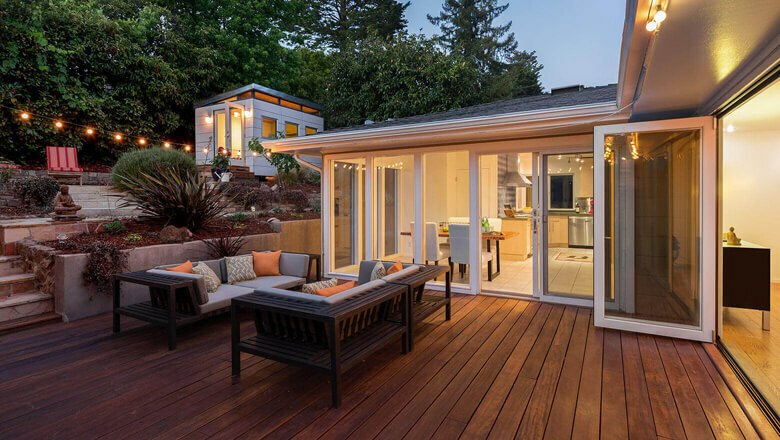 From an outdoor kitchen and a built-in fire pit to a brand new deck, enhancing your outside area is in. Sure, it’s easy to picture yourself hosting BBQs on a gorgeous deck on warm summer evenings—but that dream comes at a price. A new deck alone can run you $17,000 for an ROI of 65% . However, when you let your green thumb and imagination go wild, you’ll be amazed at how you can add value to your home on a budget. In lieu of a deck, create a peaceful bistro area with bricks or pavers, and then add cost-efficient accouterments, such as brightly colored flowers in decorative pots, a small gazebo, a store-bought fire pit, and some party lights. Throw in a $15 bottle of your favorite wine, and your outdoor wonderland is good to go. Cost: $1,500—give or take. Gazebos run the gamut when it comes to size and price, but you can get one for around $500; $700+ for a 10×10 DIY patio paver kit; $200 for a fire pit; and $100+ for pots and flowers from your local garden center. A beautiful bathroom is a must for many homeowners, but it will cost you: The average cost of a bathroom addition is just over $80,000 , and only garners a 57% ROI. Instead of spending big bucks, consider minor upgrades to the existing space. For example, add a double vanity, a new showerhead and faucets, and make old grout look new again with stain to up the luxe factor. Cost: Expect to pay about $1,000 for a double vanity , and $400 for a new showerhead and faucet. Unless you’re handy, you’ll want to contract these tasks out. Grout stain will set you back only about $20 a bottle, and applying it is something you can easily do yourself. Time investment: Expect vanity installation to take a full day or more if you have to demo the current vanity and repair walls, tiles, flooring or plumbing before installing. A showerhead and faucet can be replaced in an hour or so, but the grout stain might take a couple of hours, depending on the size of the room. If you’re stuck with outdated appliances or hideous cabinets, a kitchen remodel is likely high on your list of improvements. But increasing home value with a new kitchen can fry your bank account: A full kitchen makeover can run a whopping $122,991, while recouping just over 60% in ROI. To update for less and wow your kitchen in a weekend, make some wallet-friendly upgrades: fresh paint, a new faucet, updated lighting (upscale pendant lights are a good choice), and new cabinet pulls. Paint tip for a bright kitchen: Check out the Pantone Color of 2017, Greenery . Even budget-friendly home improvements can set you back quite a bit. Cost: Cabinet pulls start at about $2 each, while paint will run $100 to $200 , depending on the type and the square footage of walls and the ceiling. A new faucet can run $100+, depending on style and finish; and pendant lights can be had for $50 or so each. Unless you’re very confident about your plumbing and electrical abilities, hire a pro at about $80 and hour to install your faucet and lights. Time investment: A DIY painting endeavor depends on the size of your kitchen—and how many friends you get to help! Faucet installation and wiring for new lighting could take up to a day, depending on how handy you are. Even budget-friendly home improvements can set you back quite a bit. Use our Home Improvement Cost Calculator to get an idea of how much your project will cost. If you haven’t set aside the budget to bring more value to your home, you don’t necessarily have to dip into your retirement account or pay less on your student loans each month. Taking out a personal loan to fund your upgrades can be a savvy financial move, since even small upgrades will pay off both now with a home designed to fit your lifestyle, and in the future through increased resale value. Looking to make more substantial upgrades? No problem—a low-interest SoFi personal loan can help you add value to your home without straining your wallet.